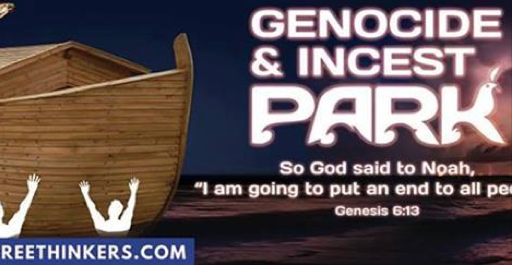 Noah’s flood really did happen. To deny it’s a real event, accurately recorded in scripture, is to deny the trustworthiness of the entire Bible. 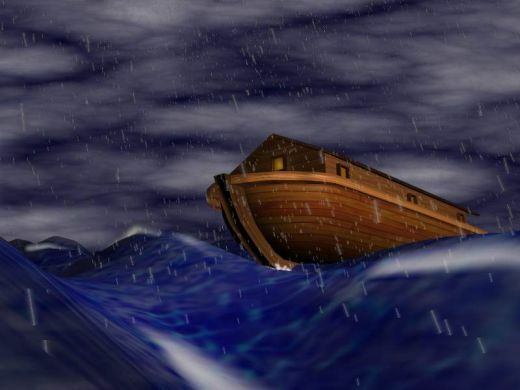 Noah’s Flood is NOT a fable, myth or parable and Christians need to know how to answer the most basic questions that people raise regarding this incredible event. To those of us who believe in Biblical inerrancy, the scriptural account of a worldwide flood is not hard to believe. We know the entire earth could be flooded because God originally created the earth as a planet of all water. On day two of the Creation week, the wording indicates a lot of the earth’s water was taken up into the clouds. Some have theorized that this was a sort of vapor canopy and it shielded the sun’s rays… possibly the reason people lived longer in those days. It’s quite humorous that lately you hear the claim from scientists that Mars was at one time flooded with water. 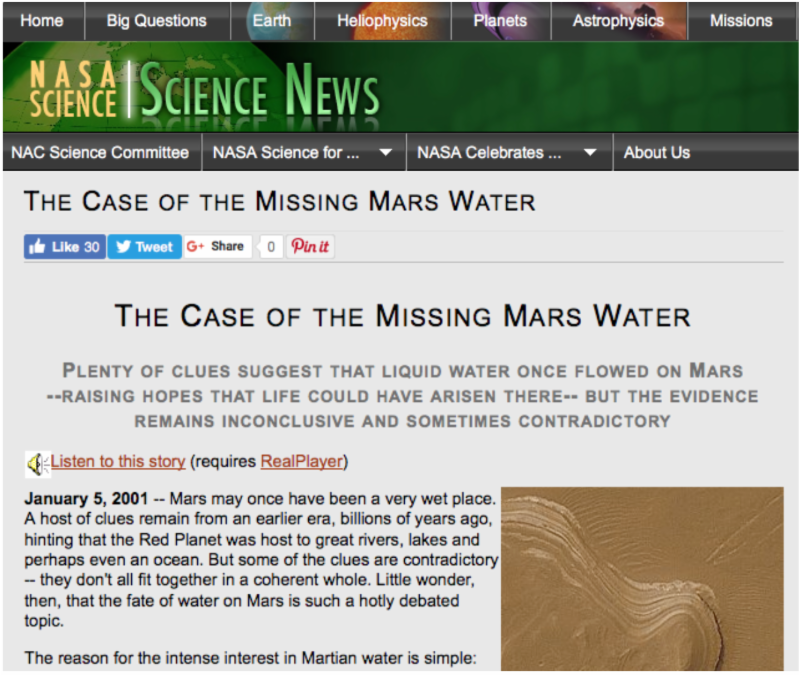 (1) There’s not a drop of water on Mars today, but they think it was once flooded! But the earth, with 5/6 of the planet covered with water today, couldn’t have had a worldwide flood. Please, where is the common sense? But realistically, all this is simply an attack on God and His authority. They don’t want to admit that God can do anything He wants, anytime He wants. Let’s face the facts–God created the heavens and the earth by speaking them into existence (Ps. 33:9). We can never truly grasp that fact because we’re mere mortals with limited brains and understanding. So it’s not necessary that we totally understand everything about how or why God does what He does. But God says we can trust what He reveals in His Word to be true. So we do, believing and defending every Word of the Bible, including the account of the worldwide flood. But the unbelieving world doesn’t accept that the Bible is God’s infallible word-for-word truth. Most non-Believers think the creation story, the worldwide flood, the account of Jonah and the great fish, etc., are fanciful, imaginative and made-up stories. 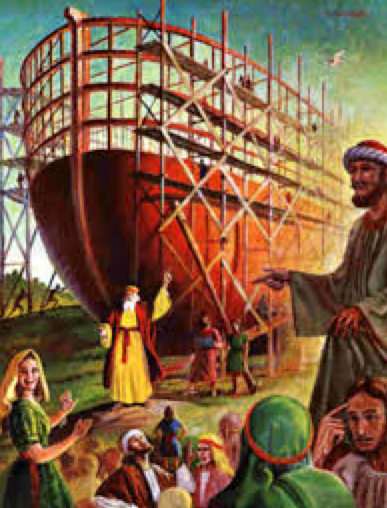 And based on the number of people who are upset with the mere notion that Noah’s Ark was being rebuilt, the sight of the massive structure must have struck a deep-seated nerve in non-Bible Believers. They’re aghast that the Bible could be portrayed so boldly as being 100% true, every word. They SHOULD be concerned because if they can’t shout down the truth about the accuracy of the story of Noah, then other parts of the Bible might also be true–like heaven and hell, and who goes where. Oh what a comical dilemma the rebuilt Ark is for those who don’t believe the Bible is God’s infallible Word. They’ve raised over $10,000 to put up more billboards. But as of today the billboard companies in the area have declined to give them any more advertising space. 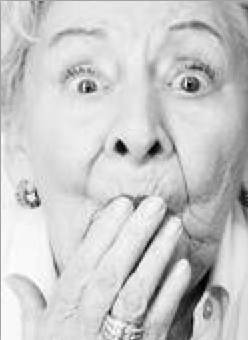 And here at Compass we know that just advertising our conference coming up this September has caused some people to come unglued! We’ve had more feedback on our Compass’ Facebook conference ad than we ever imagined possible. Yet this ad’s received over 500 likes and over 400 shares to date! That’s amazing for a normal “look-what-we’re-doing” post, much less a business ad! Unfortunately many of the non-approving comments have had to be deleted due to the foul language used attacking our stance that the Bible is 100% true. The tone of their arguments really sound more like accusations because, again, if they lose this argument, oh dear, the Bible may be true. And that of course is unacceptable to have to be accountable to a sovereign and righteous God. The bottom line is that this accurately replicated Ark is inciting nervousness in the non-Believer. And God may very well use it in an evangelistic way. Hey, when we SCIENTIFICALLY raise eyebrows proving the world was once totally flooded for over a year, then next to fall could be evolution itself–Satan’s biggest lie! So their annoyance will move to anger to furious wrath. We should expect it. In fact, the Bible says that in the time in which we live there will be mockers mocking. And they will vocally deride both the flood and the Second Coming. Therefore, to provide some armor to use when this discussion comes up with friends, family and coworkers, here are basic answers to some of the typical arguments against Noah building an Ark and surviving a horrific and catastrophic flood of the earth. This is the classic mistake of assuming that the mountains like Mt. Everest were that high prior to the flood. But they were not. It didn’t even rain before the flood… which I’m sure made Noah and his family the laughing stock of earth at the time he was building the Ark. Below in Ps. 104:6-9 you can plainly see that after the world was flooded,THEN the mountains were raised and the valleys created by God. So the water only had to cover the highest mountain at the time of Noah. They’ve now discovered plenty of water below the earth’s surface. 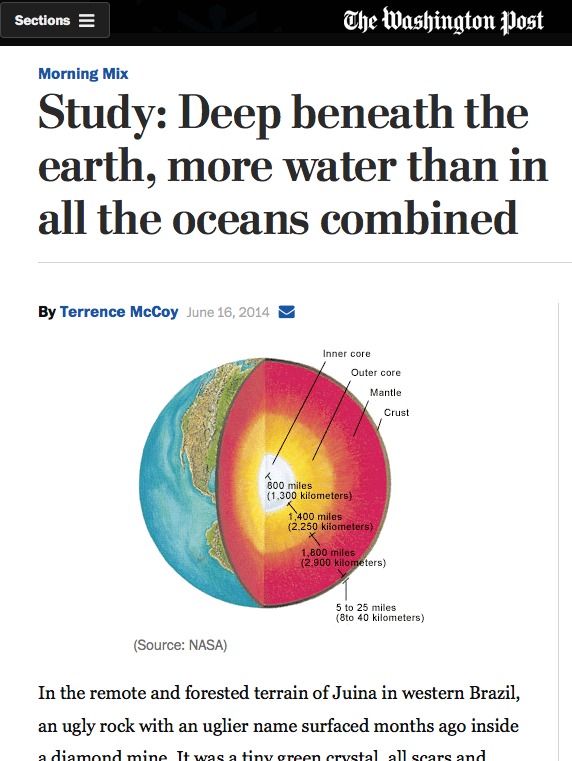 Scientists now have discovered there is a lot more water below the surface than above. Therefore there is certainly plenty of water to flood the earth. Also, there is enough water on the exterior of the earth today that if the earth was smoothed over, the mountains flattened and the ocean depths raised, the water would be two miles deep over the entire earth! It’s also worth noting that the reason we have bad weather today is because when God “raised the mountains and lowered the valleys,” the height and topography of these NEW mountains caused the storms, tornadoes, flooding, hurricanes, tsunamis and such that we have today. And even more interestingly, during the coming 7-Year Tribulation the Bible says the mountains will again be lowered. Therefore after the tribulation when Jesus reigns on the earth for 1000 years, there won’t be weather problems with which He’ll have to concern Himself. The removal of the high mountains will smooth down the earth’s surface to be more like the earth before the flood. There’s no telling how beautiful the earth was prior to the flood. The residual beauty today is probably only slightly similar to the unimaginable lushness of original earth created by God. All we know is that the destructive flood and receding waters radically rearranged the earth’s surface. The flood lasted for more than a year so there is no way it was a local flood, it could only be global. And if it were local, there would have been no need for an Ark to save mankind and all the animals. Trying to make it local undermines the specificity of the account in the Bible, making a mockery of scripture. God is God, He can do what He wants. He makes the rules and didn’t consult us humans. He defines sin and the penalties for unforgiven sin. What He does, according to the Bible, is in our best interest, even if we don’t understand it. That is simply untrue. The evidence for a worldwide flood is overwhelming. 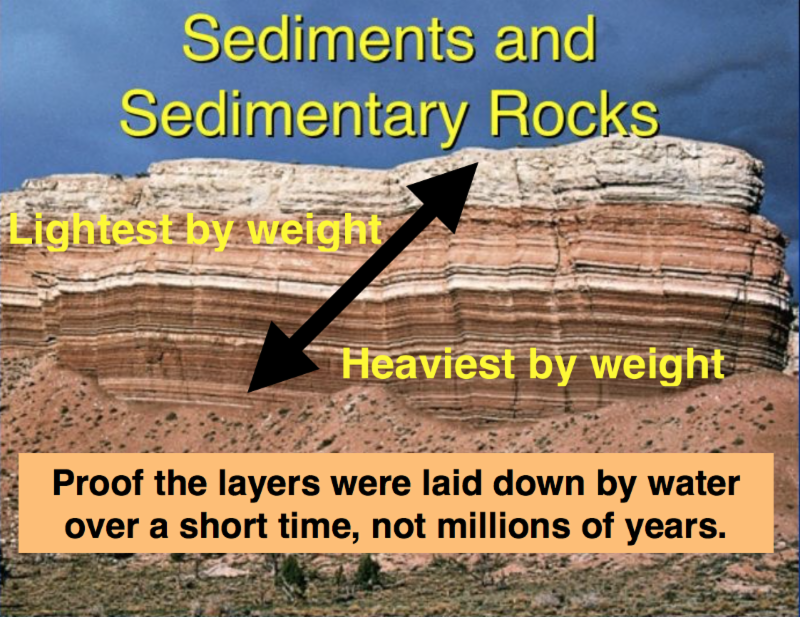 If there were a catastrophic worldwide flood where much or most of the water came from below, you would expect to find layers of sedimentary rock laid down quickly by water containing billions of fossils. And that’s exactly what we find today, billions of plants and animal fossils laid down in sedimentary layers all over the globe. They were drowned and buried so quickly they couldn’t even be eaten by scavengers. 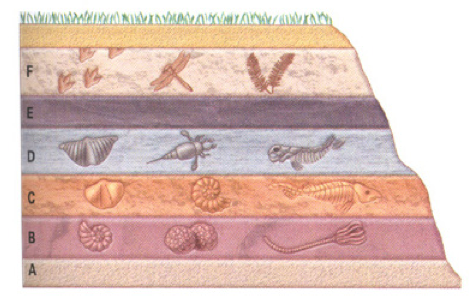 And to add cold water in the face of evolutionists, the layers of sedimentary layers all over the globe are laid down by weight, the heaviest material at the bottom and the lightest at the top and perfectly graduated by weight in-between. Exactly what you would expect from a worldwide flood. Millions of fish died in the turbulent waters during the flood and are fossilized today for us to see. Below is a fish fossil that not only contains a fossilized fish, but also fish feces near his mouth. When a fish poops in the water, the feces disintegrates in about 20-30 seconds. So for the fish to have been covered and fossilized together it would have had to have been a quite sudden and catastrophic event. Even more interesting is that the fish and poop fossil was found near the top of Mt. Elbert in Colorado, the highest mountain in Colorado. How did those fish get buried quickly up that high if there had been no worldwide flood covering the mountains? Why can fish fossils be found on or near the top of every mountain worldwide? Because the flood covered the whole earth! That’s precisely why the rebuilt Ark in Kentucky is raising so many eyebrows. It proves that the Ark, built to the dimensions God gave Noah in Genesis, is large enough to contain two of every kind (not species) of animal in the world, Noah and his family and food and water for all to live for over a year, with room to spare! The rebuilt Ark in Kentucky even shows how Noah’s family would have been able to care for all the animals and dispose of all their waste. It is likely Noah and his family only had to deal with about 6700 individual animals, and most of them were small and easily maintained. Dinosaurs are often brought up for ridicule due to their size. But only two dinosaurs would have been needed, and most dinosaurs were about the size of an average sheep. Not to mention, you didn’t need to bring along adults of every “kind,” two youths of each kind would do. 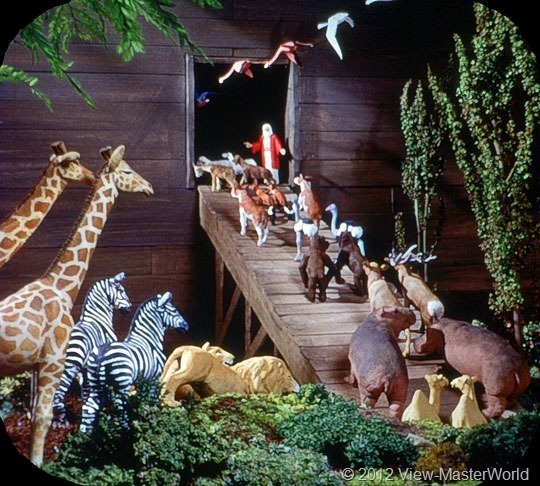 The Bible says God gathered the animals and birds to the Ark. The Bible says God brought the animals. He certainly could have supernaturally brought them from afar. But also it’s possible that there was just one continent at the time on the earth. The Ark was built only 16 centuries from the time of Adam and humans were originally built perfect. The ravages of sin had only begun to take its toll. The Bible says they were building cities, making musical instruments and even working with metal (Gen. 4:17, 21, 22). So there’s no reason to think that Noah couldn’t have built the Ark. The Bible doesn’t say whether or not Noah employed outside personnel to assist in the construction, which is possible. But even if the Ark construction was limited to Noah and his sons, they had ample time to build the Ark…between 80 and 100 years. It’s not surprising that the God-given ratio of 30 X 5 X 3 is the standard ratio used in shipbuilding today to be the most seaworthy. Not true. God is a God of justice and sometimes killed tens of thousands at a time in the Old Testament due to mankind’s sinful ways. Thankfully He sent His only Son to pay the price for our sins so we could escape the penalty of eternal death. This free gift is open to anyone who believes the Gospel. And we need to never forget THE REASON for Noah’s Flood: God’s worldwide judgment on a sinful people. Our loving God is a righteous but just God. 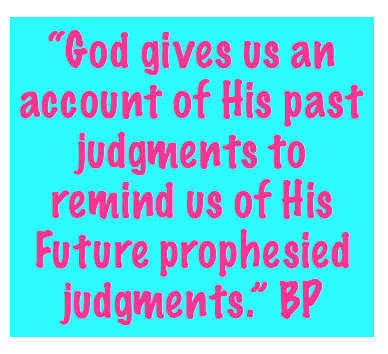 God gives us an account of His past judgments to remind us of his future prophesied judgments. God is not mocked. There is a penalty for sin. 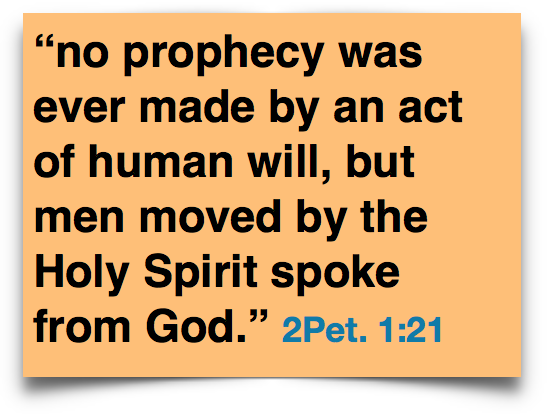 And there is a future worldwide judgement coming when the Lord removes the Holy Spirit from the earth. The Flood of Noah is a reminder of that fact. 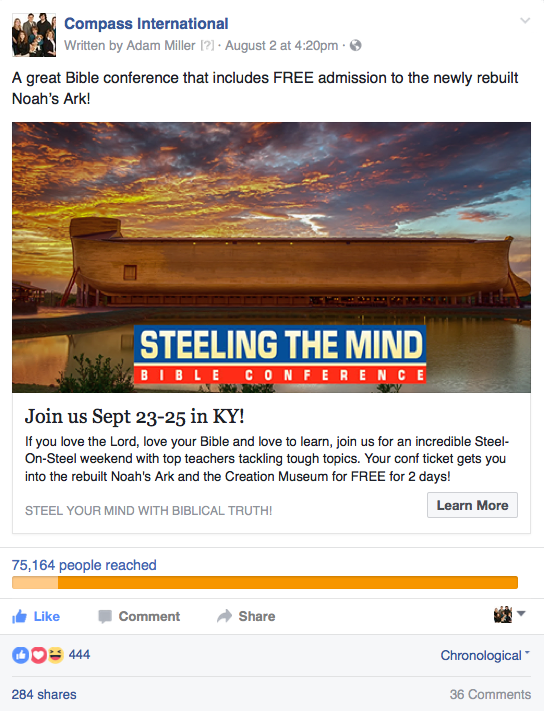 So we hope you can join us in September for the Steeling the Mind Bible Conference at the rebuilt Noah’s Ark. 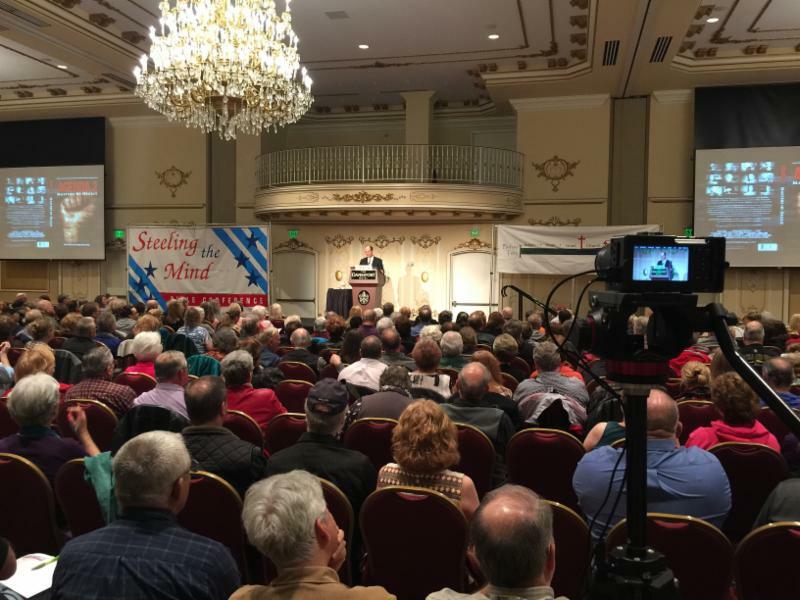 It’s a great weekend of Bible teaching by great teachers tackling tough subjects. 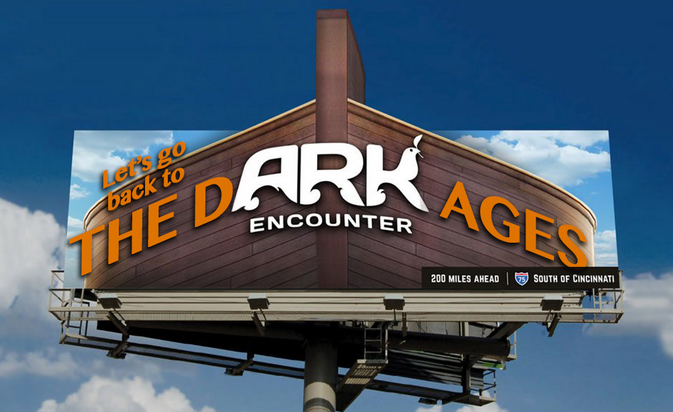 And best of all, your conference admission gets you into the Ark, and AiG’s mind-boggling Creation Museum, for FREE, for two days! Click here for all the details, including discount hotel rooms in the area.